The origin of Cann is completely unknown; if there was any written record of the ruin, it did not survive into the Third Era. Whatever its origin, the ruins first appear in written record sometime in the Third Era when a group of Manic residents in the Shivering Isles came to inhabit the ruin. The group wished to put on an event which they called the "Elaborate Spectacle", an event which was supposed to cause love and shared pleasure between a group of captives. Though they were not always of the Isles, they were all treated like royalty for a set amount of time. The purpose of this treatment was to calm their minds, ease their souls, and brighten their spirits so that the Elaborate Spectacle could unfold as planned. The true effect, however, was entirely unforeseen by the captors. Their unexplained captivity had an effect on the captives opposite that which was predicted; they believed they were being forced to fight in a sick arena, and instead of loving one another when the Spectacle came around, they attacked, gored, and eventually killed each other. The captors fled the ruins of Cann, returning to their home in Bliss and leaving behind the carnage they had caused. Ironically, the ruins would again become home to the residents of Mania. In between this catastrophic event and the last Greymarch, the ruins of Cann became home to Heretics and Hungers. It was cleared out by Sheogorath's Champion in 3E 433. 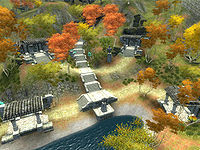 For more information on the ruins of Cann, visit the Shivering Isles Cann article. ^ a b A Perfumed Letter found in the ruins of Cann. ^ A Scented Parchment in the ruins of Cann. ^ a b c A Scroll found in Cann.